Sue's Rubber Stamping Adventures: Tim Holtz Class Project Finished!!! Close up of right side. 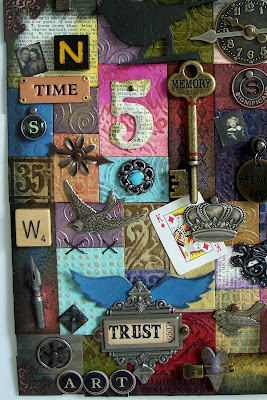 Hello, here is the completed project from my Sunday class with Tim Holtz. The kit for the class included all of the background pieces of grunge paper cut and embossed. We then used four or five different techniques to ink the pieces. 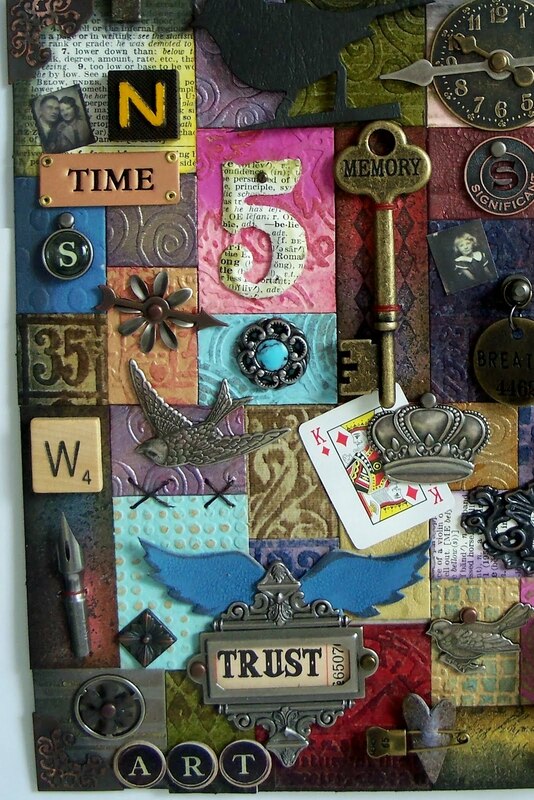 Some are crackle painted, distress inks, metallics, double distressed, stamped over distress inks. So, because it is a class, and you have a basket of supplies to share, we didn't plan it all out then color up the squares, we just used what colors were available. After all it is supposed to look like a calico quilt when you finished. This took us three hours. We began by placing the finished pieces onto an 8x8 piece of grunge paper according to a drawing that was supplied. Then, the fun began, we opened a large bag of Tim's elements that was in every kit and decorated it as we pleased. I used a few things from home, but mostly it is what we were given. Then you just added the hanger. 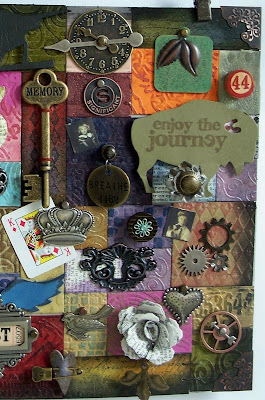 This would be so fun to make for a friend, a spouse, or a child, with pieces and pictures from special moments. I'm finishing up my Grunge Board Book from the other class and when I do , I'll post some pictures. Oh My Gosh this is awesome!!!! I'd love to create something as beautifully detailed as this!! I just looked down and noticed that I'm turning green! Green with envy that you met Tim (my idol) in person!! Lucky you!! Great photos! oh wow stunning - you star. How very cool, Sue! Sounds like a great class! OMG! I love, love, love this! You just can't stop looking. love that you added the Buffalo on this!! 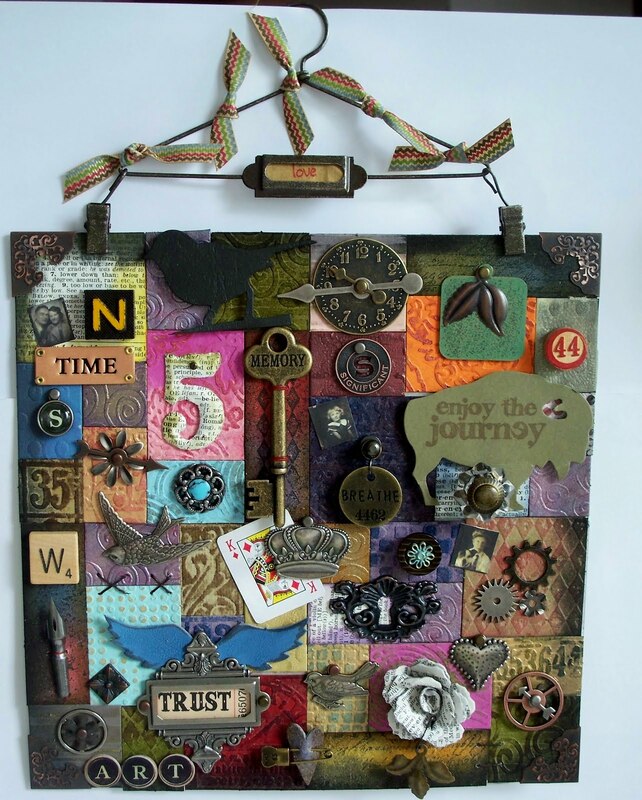 WOW Sue - this is truly awesome - what an amazing experience to make this in a class! I could soo imagine having a great time with friends putting something like this together! Love it! Can't wait to see the book. And I let Steve know its your fault that I'm buying Tim's book! Love Ya! Stunning! So fab, it's brilliant. This is action-packed Sue, you have certainly made the best of the supplies on hand and then some!! Love the quilt effect and all the trinkets and treasures around every nook, stunning! !